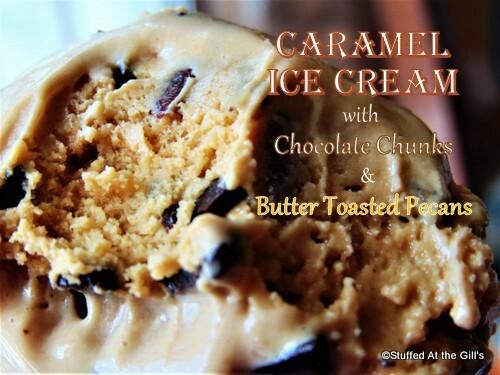 Creamy, smooth Caramel Ice Cream liberally sprinkled with Chocolate Chunks and Butter Toasted Pecans makes a hot summer day just a little more bearable! It's hard to believe less than six weeks ago we had snow falling from the sky and now today, July 30, we have had heat warnings going on two weeks! The weather may be wacky but this ice cream will make these hot days a little more enjoyable. 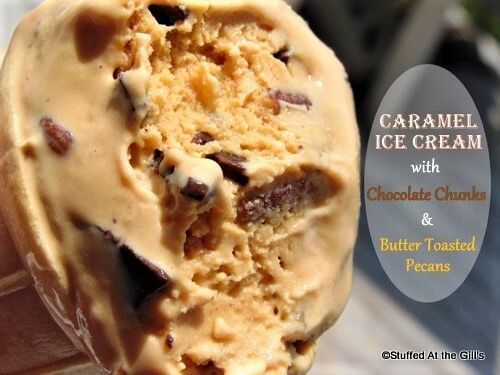 I'm a caramel lover and seldom make chocolate ice cream but I do like chocolate in small doses and the chocolate chunks with the pecans make this a very tasty treat. 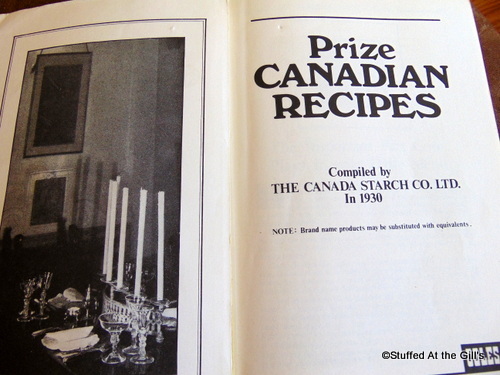 The idea for this recipe is from the "Prize Canadian Recipes" compiled in 1930 and republished in 1975. The original recipe was for plain caramel ice cream but I thought I'd "gild the lily" with the chocolate and pecans. I've also changed/removed/added some of the ingredients one of which was the brown sugar. I tried several times to caramelize brown sugar and, let me tell you, it's hard, hard, hard to caramelize brown sugar without burning it or not caramelizing it at all. It's so hard to tell by the colour! Well, it was hard for me so I gave up and used white sugar with much better results. 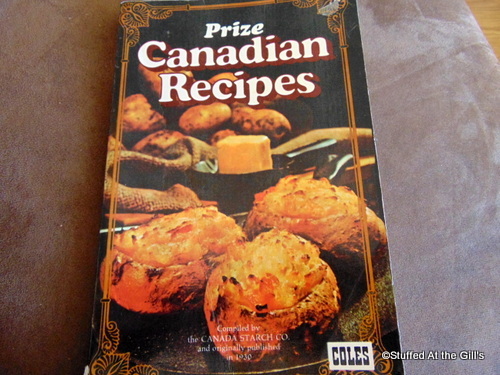 Originally published by the Canada Starch Co in 1930 and republished in 1975 by Coles. Republished just as it had been away back in the olden days. 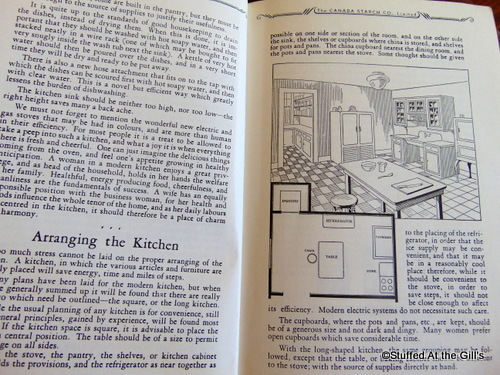 The perfect 1930 kitchen. The envy of every homemaker. The original recipe. You'll notice the one paragraph of instructions compared to my epistle of "how to do it." Here's my 2018 version. I'll dedicate this ice cream recipe to my dear husband, Don, whom I married 40 years ago today. Happy Anniversary, sweetheart! Make the caramel. Gently heat ¾ cup of sugar with ¼ cup of water. 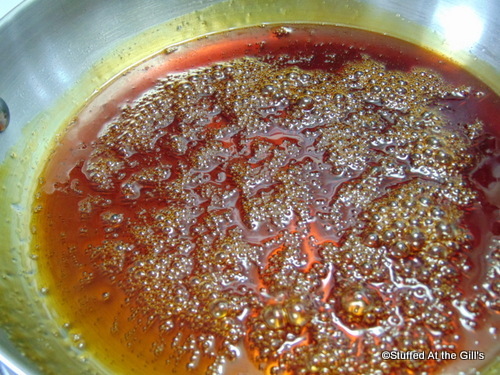 Stir until sugar is dissolved, then let simmer and boil over medium low heat until desired colour is achieved. Do not stir at this point. Be very careful as the sugar will turn and burn in seconds. 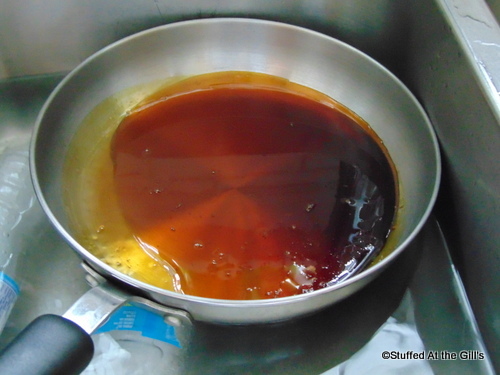 Once the desired caramel colour is achieved, remove from heat immediately and set pan in a cold water bath to stop the cooking. I usually remove my caramel just before the desired colour and let it finish cooking off the heat. If using the powdered skim milk mix with the whole or evaporated milk. 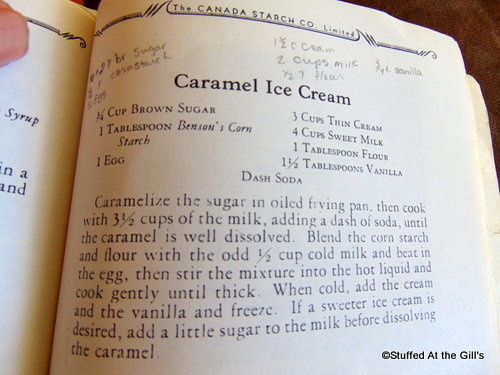 When the caramel has stopped cooking return to stove and add ½ cup of the milk. Keep the heat to medium low. 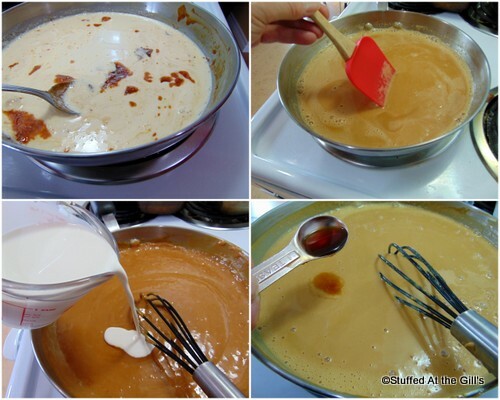 Scrape the caramel from the bottom of the pan and stir occasionally until dissolved in the milk. 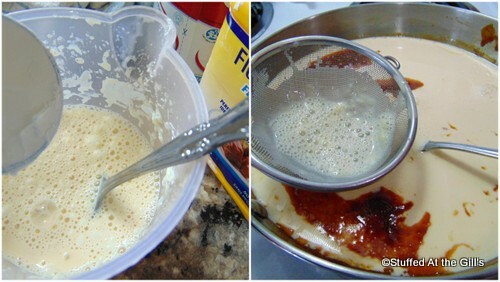 Take the remaining 1½ cups of milk and stir in the cornstarch until no lumps remain and stir in the hot caramel milk. Stir until mixture thickens and comes to a boil for a minute. Turn off the heat and add the cream, vanilla and salt. I used a mixture of light and whipping cream. Taste for sweetness and add up to a ¼ cup more sugar, if desired. Remember sweetness diminishes in frozen products. 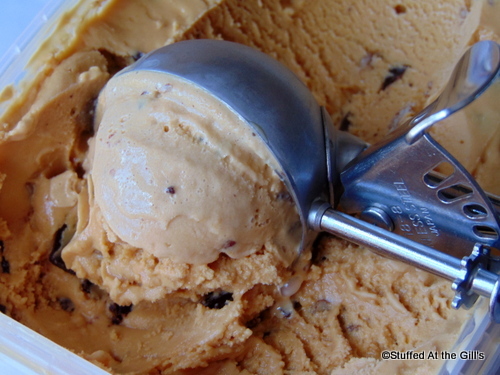 Pour the ice cream mixture in a heat proof covered dish and refrigerate at least 4 hours until thoroughly cold. Overnight is best. I placed my mixture in the freezer for half an hour just before churning to make sure it was icy cold. While the ice cream mixture is chilling make the toasted pecans and chocolate pieces. 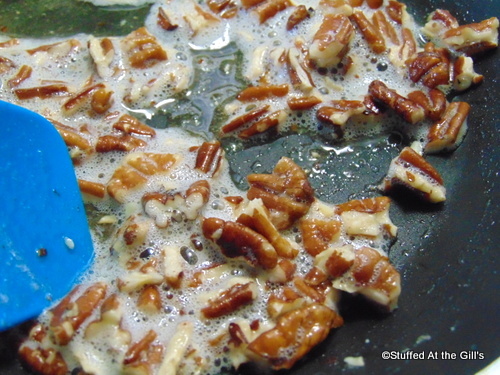 To make butter toasted pecans: Melt 1 tablespoon butter in small frying pan over medium heat. Add the chopped pecans and stir until they are lightly toasted. Refrigerate until ready to use. 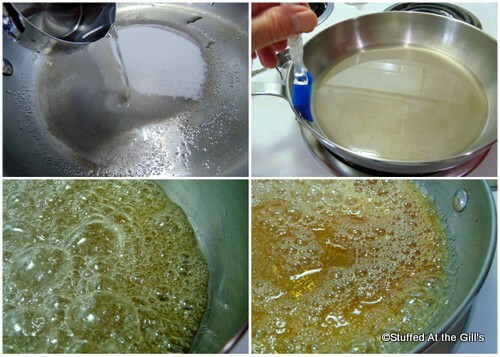 Make the caramel by gently heating the sugar and water together until the sugar is dissolved. Do not stir after the sugar is dissolved. You may wash the sides of the pan down with a wet pastry brush if there are any undissolved sugar crystals. Cook over medium low heat until sugar starts to caramelize. Keep your eyes on the pan as the sugar can go from caramel to burned in a matter of seconds. I usually take my caramel off the heat when it looks like the bottom right picture and let it continue cooking off the heat. This is about the colour you want for a nice, rich caramel. I find any darker will be too burned for my taste. Remove from the heat and immediately set the pan in an ice cold water bath. This will stop the sugar from cooking any further. I didn't have any ice but had a couple of frozen water bottles that worked well. 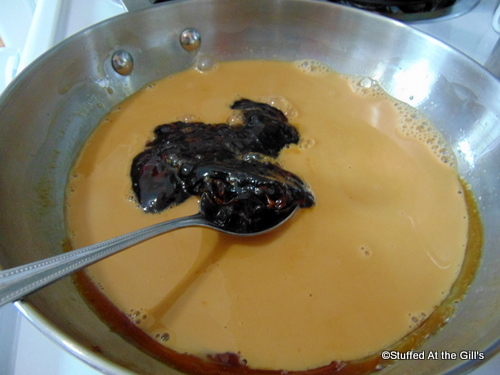 When the caramel has stopped cooking return to stove and add ½ cup of the milk. Scrape the caramel up from the bottom and heat until the caramel has dissolved in the milk. 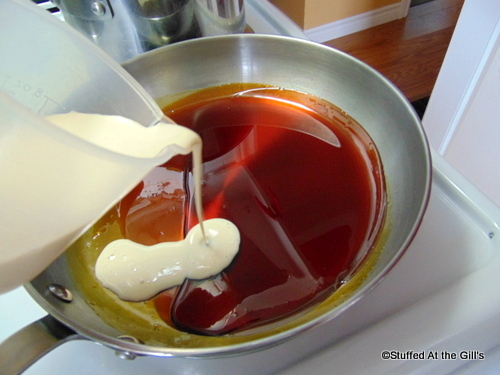 Dissolve the cornstarch in the remaining milk and add to the caramel milk. I use a strainer so there won't be any lumps in the mixture. Keep stirring until mixture thickens and boils for 1 minute. Take off the heat and add the cream, vanilla and salt. Taste for sweetness and add more sugar, if desired. Pour the ice cream mixture in a covered container and place in refrigerator to chill at least 4 hours or even better, overnight. While the hot mixture is chilling make the chocolate chunks. 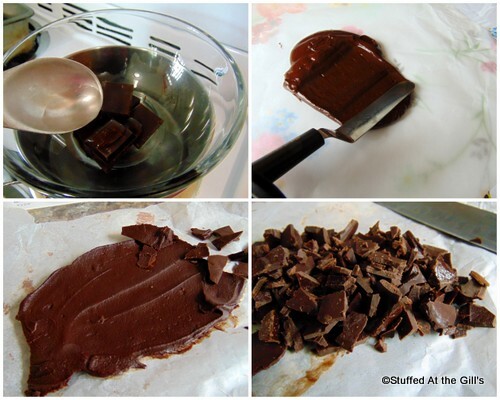 Melt the chocolate and water together until creamy and smooth. Spread out on a piece of parchment paper and place in freezer. When frozen chop into chunks. Store in a covered container in freezer until ready to use. Melt butter in pan over medium low heat. Add pecans and stir until toasted. Store in refrigerator until ready to use. 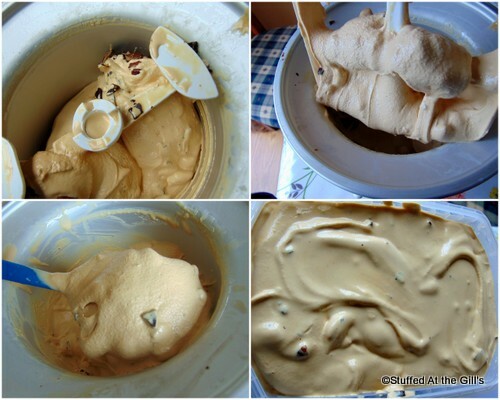 When the ice cream mixture is thoroughly chilled churn it in your ice cream maker. 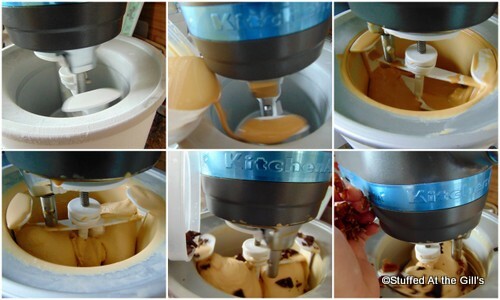 It took about 25 minutes to soft serve in my new KitchenAid ice cream maker. A minute or two before it's finished add the chocolate chunks and pecans. When the ice cream has been churned remove the dasher and scrape into a freezer container and let ripen at least 4 hours in the coldest spot in your freezer. When the ice cream is frozen solid it's ready to scoop out for your eating enjoyment. It's a sweltering, hot day. I had to eat this before it melted. Such are the woes of a blogger, ha, ha. 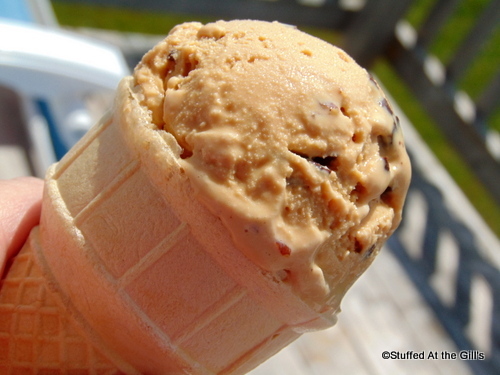 Creamy, smooth ice cream on a hot summer day.